What's in a name? Just ask the guy who slips the words "my Ferrari" into every third sentence. You have to call cars something to differentiate them from, say, loaves of bread. If you're German, this usually means assigning a specimen-collection tag, like E350. If you're American, you oversell: the Pontiac Parisienne, for example. Beyond just marking a product, a model name can make a marque; ask Acura what the Legend did for its brand. A name can also doom, like when Buick discovered Quebec buyers weren't keen on driving a LaCrosse, as it's local slang for self-gratification. Certain poorly chosen model names are legendary. Ford, or more likely highly paid consultants, had romantic, interstellar intentions when they pulled the name Probe out of their, um, heads, but it instead only evoked the snap! of latex gloves and extraterrestrial incursions. The most superb car names, however, are born in Japan, expressed in Latin letters instead of Japanese characters. Japanese manufacturers are often more concerned with "mouth feel" and what pleasant sound a certain combination of words or letters might make, discounting silly things such as grammar and relevance. The Mitsubishi Chariot Grandio Super Exceed, which you might expect to shatter the sound barrier, is, alas, better at hauling groceries. The innocent gutting of the English language involved in the following 5 vehicles is particularly close to our hearts. Mazda was eager to cash in on the Bongo's intrinsic cachet, having witnessed successful exploitation by Ricky Martin and the cheek-tastic Bongo jeans company, so it kept the venerable Bongo name around. Mazda blessed the van-loving world with not just the standard Bongo but also a Bongo Friendee and Bongo Brawny. Any Bongo brawny enough to be used in a crash scene in Mad Max is good by us. 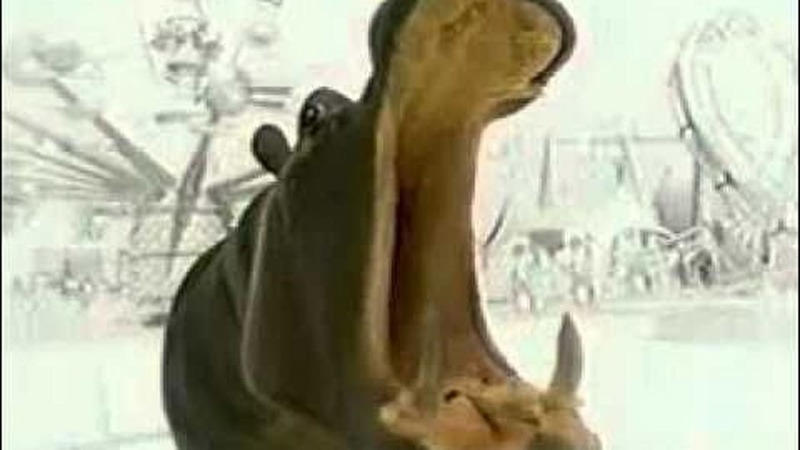 In the meantime, we'll enjoy watching this Bongo Friendee camper enter a jaw-stretching contest with a hippopotamus. 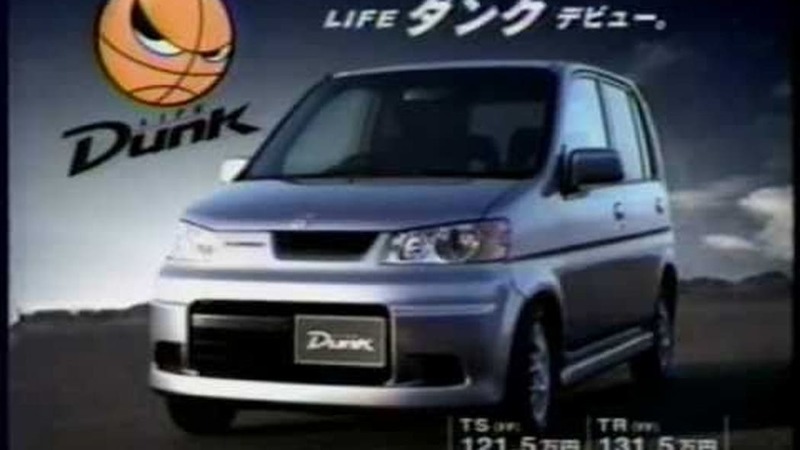 This is an example of one strange name for a Japanese car that also made it to the States. 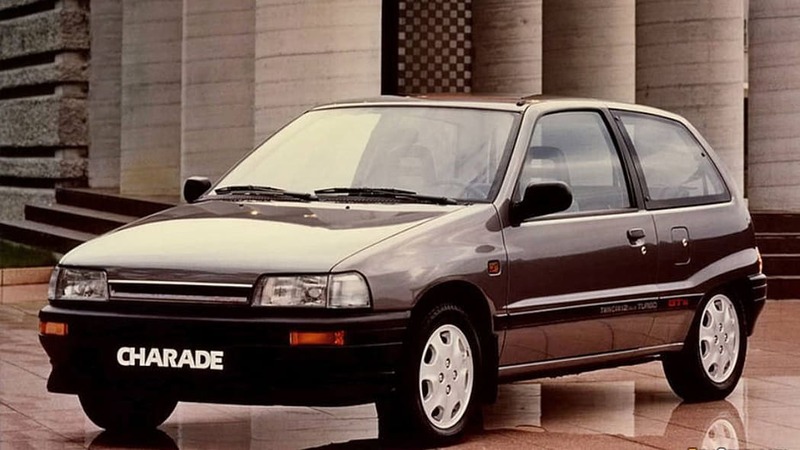 For several years Daihatsu sold the Charade in America, and we were forever baffled why Daihatsu would call their car a joke or a prank. Even if it wasn't a great car, it's only natural for a company to try to make a car seem more appealing than it is. 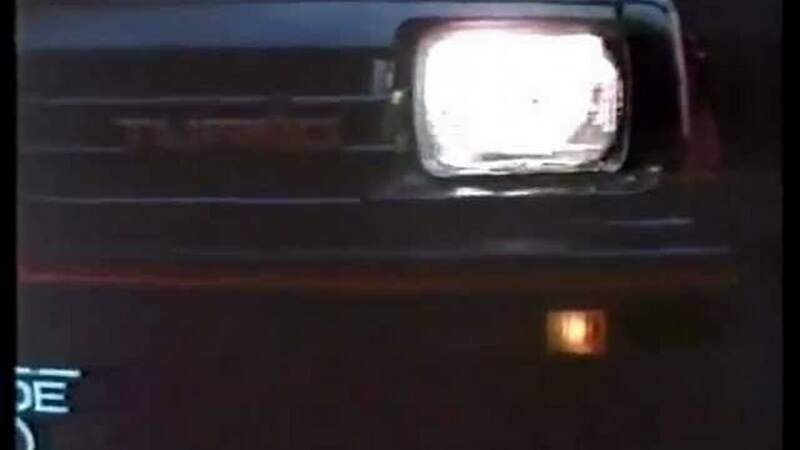 Sadly, we never got either the zippy little Charade Turbo in this country, which is illustrated above as being able to transform into a cartoon panther. We also never got the one with the strangest name, the Charade Social Poze, whose owners are unlikely to understand the amazing synergy of those three words which combine the irony, veracity, and naked sincerity of a Fellini film. One-and-a-half liters of economy-minded righteousness promise little and return fully on meekness, value, and total anonymity. Ah, life, that enigmatic thing whose myriad mysteries are made flesh (or, more precisely, metal and squarish) by Honda. Attach a turbocharger (and optional four-wheel drive) for 62 horsepower, and what you have is a slam dunk. But based on the commercial for the car, it's not a slam dunk from our time, but from a glistening metallic future with ray guns and swing music. We also can't help but get excited by the enthusiastic narrator who exclaims "Turbo! Dunk! Honda!" 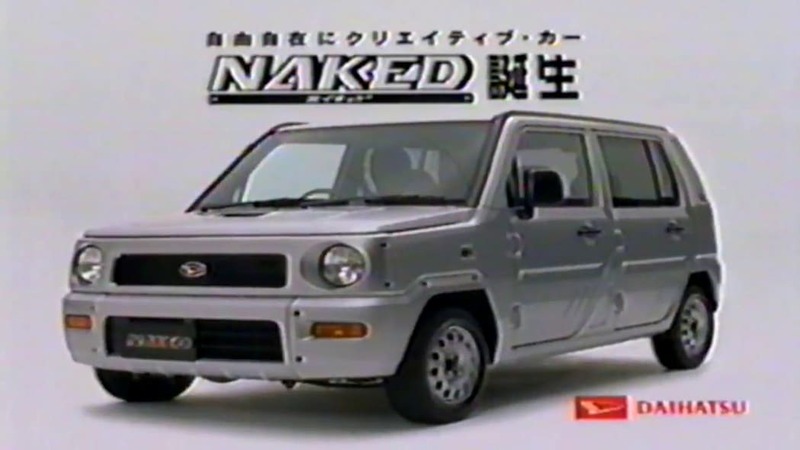 As baffling as the Charade is the Daihatsu Naked. Perhaps it was a reference to all the exposed bolts and hinges, like this car is bearing all as opposed to the sleek buttoned-down options from other companies? Maybe it was meant to say this Daihatsu isn't hiding anything? At least it's a funky looking little thing with micro-Hummer or Jeep styling. Update it and give it a new name and it would fit right in with America's slew of subcompact crossovers. Why be satisfied with a sport-utility vehicle when you can trade sport for intrigue and your vehicle for magic powers? Who wouldn't love to have a wizard on hand to conjure a perpetually full fuel tank and manifest a plague of locusts inside the BMW that just cut you off? 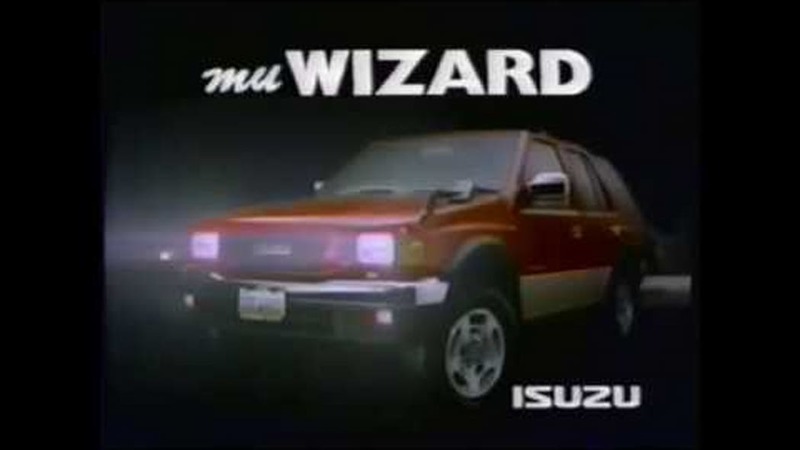 Alas, those who have known the MU Wizard as the Isuzu Rodeo know it to exhibit as much magic talent as Criss Angel. But according to the above commercial, the Wizard was at least capable of wonder, imagination, "zing," adventure, romance, and dreams. And the first letters all spell Wizard! And apparently there was no better way to evoke this than by having a young white couple driving for their lives through a giant Las Vegas-inspired pinball table. "That's Wizard!"